"Pecans sauteed with onion, parsley, basil and ginger make plain brown rice come to life with rich, nutty flavor." In a saucepan bring 2 cups water to a boil. Add rice and stir. Reduce heat to low, cover and simmer for 40 minutes. When rice is done, melt margarine in a small skillet over medium heat. Saute onions, pecans, parsley, basil, ginger, pepper and salt. When onions are tender stir mixture into rice and mix well. I liked this recipe for dressing up the rice. Next time I would use less pecans, though. 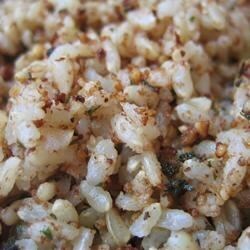 By far, this is the best brown rice recipe I've found up until now. I did use seasoned chicken broth instead of water and that probably made a huge difference. Really good and easy recipe. I didn't have pecans, so I substituted walnuts...still turned out wonderful! This is excellent!! The flavor is not to heavy,and it went perfect with the salmon I grilled. I won't buy that pre-package stuff anymore!! Hands down this is the best rice recipes I've ever had. My husband was hoping for more but it was gone. I made it just how it says but with real butter not plastic-y margarine. This is a quick and easy way to dress up brown rice. I made it for company and it turned out great! Very tasty!